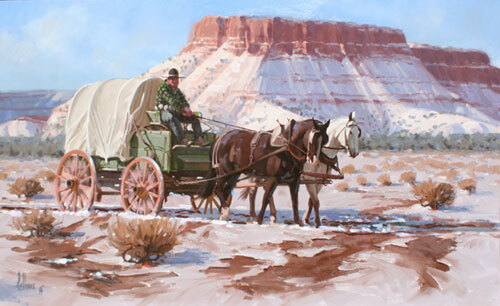 Fred Fellows, Trip to the Trading Post, Oil on Panel, 18 " x 30"
Fred Fellows works in his studio, transforming a lump of clay with ease into a masterpiece soon to be cast in bronze. With magnificent views of the Empire Ranch in the background, it’s no wonder Fred Fellows reminisces about his boyhood home in Ponca City. His exposure to the ranching way of life and the Native American culture would heavily influence his work over the ensuing years. Fred Fellows' love of and first hand experience living the ranching and cowboy lifestyle no doubt contributed to the acquisition of a membership in the prestigious Cowboy Artists of America organization. In 1997, Fred Fellows rose to the forefront of the organization and became president for the first time. By 2003, he had presided over the organization twice. 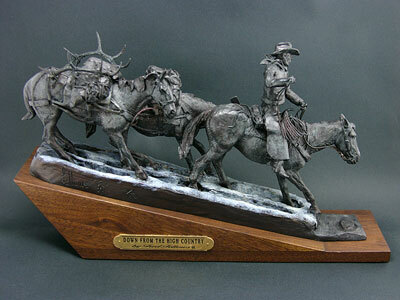 Fred Fellows, Down from the High Country, Bronze Edition of 50, 11" x 19" x 5"
Fred Fellows' paintings and sculpture can be found in some of the country’s finest museum and corporate collections including the Booth Museum, and the Buffalo Bill Historical Center in Cody, Wyoming. He has also won the Grumbacher Fine Arts Award and the Painting Institute of America Award. 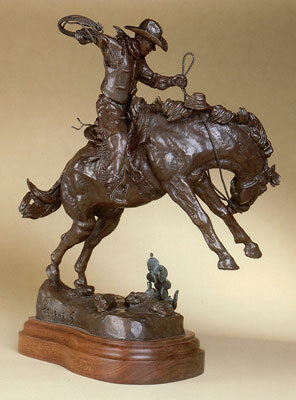 Fred Fellows, The War Horse, Bronze Edition of 50, 33" x 12" x 19"
Today Fred Fellows lives the cowboy lifestyle he so dearly loves on his ranch in Southern Arizona with his wife, nationally acclaimed sculptor Deborah Copenhaver-Fellows. 2006 - “Artist of the Year” Arizonans Official Cowboy Poetry Gathering, Prescott, AZ. Painting used for official poster of this event. 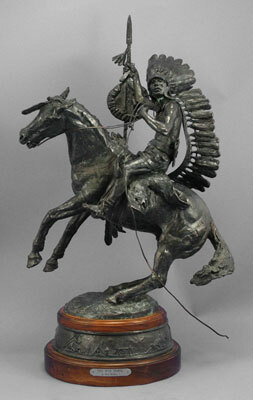 Fred Fellows, Riding Out a Bad Investment, Bronze Edition of 100, 15" x 13" x 12", Monumental Edition of 15, 61" x 59" x 60"